Just so long as it doesn’t happen too fast or all at once, most of us are ready for the snow to melt. That means our storm drains, the grated openings in the street, are going to be working overtime as melted snow and rain is moving through one of our most important urban infrastructures: the storm sewer system. Sometimes people confuse storm sewers (see pictures to the left of a storm drain and outfall) with sanitary sewers. Sanitary sewer systems are underground pipes that carry sewage directly from places in our homes and businesses such as bathrooms and kitchens. The sewage in a sanitary system is treated at a wastewater treatment plant before it is returned to the river. No such treatment exists for the water that enters a storm drain. The storm sewer system is intended to prevent flooding and keep surface water from ponding in our urban spaces. 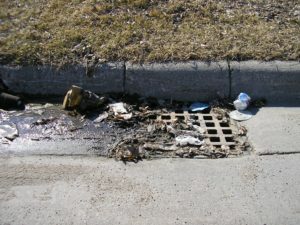 When runoff enters a storm drain in West Fargo, Fargo and Moorhead, that stormwater is not treated at a wastewater plant, but is discharged directly into the Red River or Sheyenne River through outfall pipes. 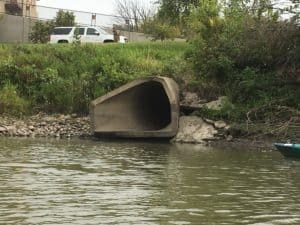 So, it’s worth taking a minute to consider how to protect our rivers from all the substances and debris that could make their way to the storm drains as the weather warms. Many ordinary activities can affect the river’s water quality. Of course, we should be very careful with automotive fluids. Even diligently fixing small leaks in our vehicles can prevent problems for river water quality. Washing a car is better done on a grassy surface where soapy water is soaked into the soil and won’t run off into the storm drain. Fertilizers or pesticides can make their way into the river through run off, especially if a lawn or garden is overwatered or excesses are not swept from the sidewalk. Even lawn clippings, leaves or sediment should be kept from the storm drains. And as for doggy doo? Well, you get the idea. When we all do our part, we can protect the water quality of the Red and Sheyenne Rivers keeping them beautiful for generations to come. 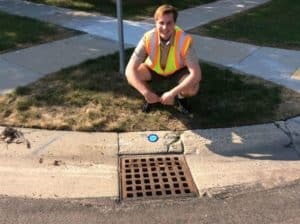 As summer approaches, River Keepers is getting ready for the Storm Drain Marking Program, a volunteer program that raises awareness about stormwater by linking human actions to pollution problems. This program is sponsored by the City of Fargo, City of Moorhead, and City of West Fargo. Perhaps you’ve seen an informational flyer on your front door knob, or maybe you noticed one of the storm drains that is already marked “No Dumping, Drains to River.” We work with individuals as well as volunteer groups (4th grade students and up). Check out https://www.riverkeepers.org/projects-activities/storm-drain-marking-program/ for more information. If you’d like to volunteer to spread the word on how a few good habits can make a big difference, contact Kim Morris at kimberly@riverkeepers.org or 701-356-8915. 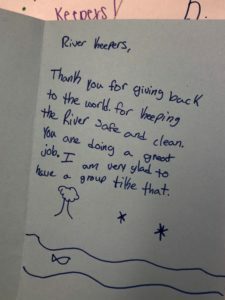 Volunteers come to River Keepers for many reasons. Every year, without fail, we see returning volunteers planting trees, picking up trash, and assisting at countless events. 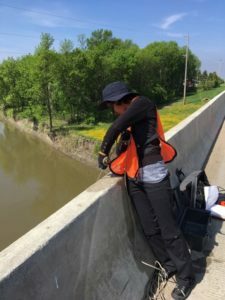 Others are one-time volunteers devoted to helping wherever whether that is for projects that allow our community to learn, sustain, or enjoy the Red River. No matter the activity, our volunteers come to support our mission to advocate for safe and sustainable use of the Red River. Something we undeniably cannot do without them and the numbers prove it. They experiment beyond our imagination. River Keepers has been around for 29 years and dozens of our projects have improved and expanded because of creative volunteers. 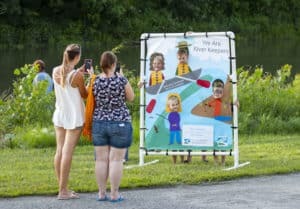 In 2018, two volunteers created a photo booth for us. One designed the poster, and another built a stand for it made out of pvc pipe. It is a fun addition to our fishing clinics, golf scramble, and Race the Red canoe and kayak race. Thank you, Jackie and Scott! Volunteers go the extra mile offering us unlimited potential. They arrive early to events before the sun is up, fill in spots last minute, and provide skills like data analysis for water quality monitoring and photography experience that captures moments by the Red River we would otherwise miss. Education is at the heart of what we do, and our volunteers deliver the most meaningful water education. Each year we receive touching feedback from students and teachers who attend the Red River Water Festival and last year was no different. One teacher came up to staff thanking our volunteer presenters for capturing her student’s attention, a difficult task on field trips. We are thankful for all our volunteers who make learning a fun and meaningful experience for youth. It is no surprise that volunteers extend our budget. With two full time staff, volunteers easily multiply our impact. In 2018, we worked with 2,150 volunteers who contributed over 4,800 hours. All of these incredible volunteers, hours, and their donations were invested to improve the Red River. 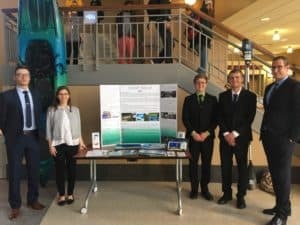 Four of these volunteers were NDSU students who decided to take their class project to the next level by fundraising for a new kayak for summer rentals and excursions. An addition that allows more people to enjoy the Red! They interpret the value of River Keepers and the Red River to others. 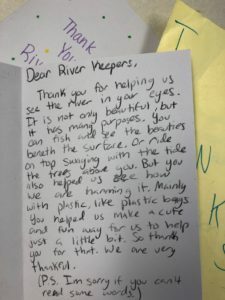 Our volunteers know us best and we are grateful when they take the time to share what River Keepers and the Red River means to them. Last year, youth volunteers decided to share their experience after storm drain marking streets and working on the T-shirt to Tote Project by mailing us cards. Whether volunteers tell us or others, they are the ones who prove our impact! For those who live in the Red River Valley, it is our spring-time ritual. 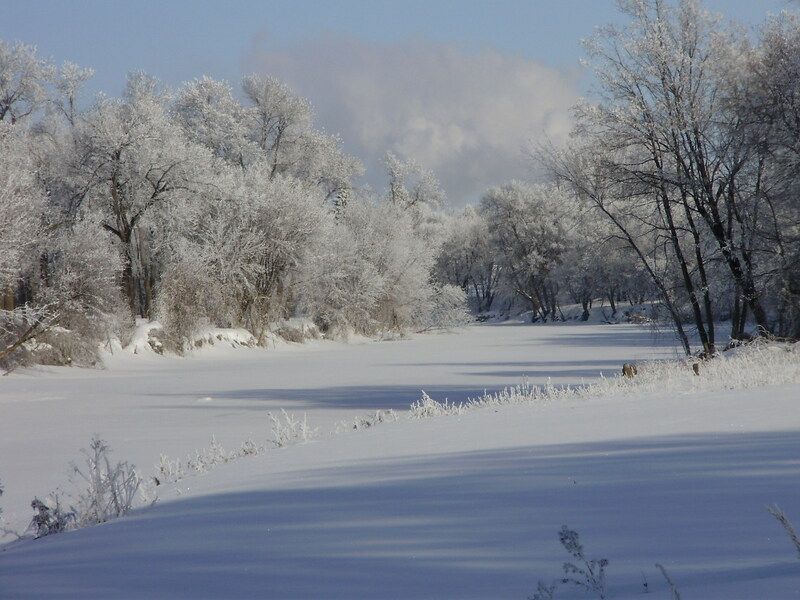 Consider the moisture content of the snow pack; note the moisture level of the soils from the previous fall; determine the frost depth; wish for well-timed days of above-freezing temperatures but freezing night-time temperatures; and, hope the rain holds off until after the snow melt has finished. Are these habits unique? Or is this just the way of life for any river community? Of course, every river basin has its own unique characteristics, but the river basin of the Red River of the North presents a challenging combination of attributes that can lead to major flooding scenarios as it flows north to Lake Winnipeg. This can partially be explained by looking at the history of the Red River Valley. It is a misnomer to call the Red River Valley a valley since it is actually an ancient lake bed, located at what was once the southern tip of Lake Agassiz, a huge glacial lake, that covered much of today’s central Canada. The ground-up, fine sediment that washed off the Laurentide Glacier as it waxed and waned for thousands of years settled to the bottom of the lake bed, leaving the present-day clay soils of the Red River Valley. Once 300 feet deep, Lake Agassiz eventually broke through the natural dams holding it to the south. The result is our current landscape where the Red River of the North drains what is today the youngest and flattest major land feature in the contiguous United States. At a little over 9,000 years old, the Red is so young, geologically speaking, that it hasn’t had enough time to cut the sort of deep channels carved by older river systems. The flatness of the landscape makes for meandering flows of water, sluggish drainage, and floods with large aerial expanses. Nowhere is the gradient steep, but the southern portion of the Red River has a slightly steeper gradient. According to North Dakota State University’s Fargo Geology Webpage (https://www.ndsu.edu/fargo_geology/whyflood.htm), a gradient of 5 inches per mile in the Fargo-Halstad area flattens to 1.5 inches per mile in the Drayton-Pembina area. In addition, the effect of deglaciation is still playing out in the region since the crust of the earth rebounds for thousands of years after a glacier retreats. Imagine something like geological memory foam returning to its original shape after a very heavy glacier sat on it. This rebound in the Red River Valley may only amount to a few millimeters per year and doesn’t have an important effect in the near term, but the process is happening at a more rapid pace in the northern portion of the valley, so the already low gradient between the origin of the Red in the south and Lake Winnipeg in the north is slowly becoming more level (see https://www.dmr.nd.gov/ndgs/ndnotes/Rebound/ for more information about glacial rebound in the area). Some of the other troublesome characteristics of our floods are simply because the river flows to the north. The delicate timing of thawing, and water soaking into the ground (slow even when the ground is not frozen because of our clay soils) is further complicated by the fact that spring thaw generally begins earlier in the southern portion of the basin. Ice jams are a common occurrence, and they create temporary dams causing flooding behind the blockage. Often, melt water from the south of the basin flowing to the north combines with more recently melted water or it is blocked by frozen conditions up north. Frozen ground can also prolong the length of the flood when water is unable to soak into the soil. Frequent flooding is inherent to the very nature of the Red River of the North and the ancient lake bed it drains. Each year, the timing and extent of precipitation and freeze patterns interact with the geological characteristics of the Red River Valley to present us with a guessing game of flood possibilities and leaving us to our spring-time rituals. 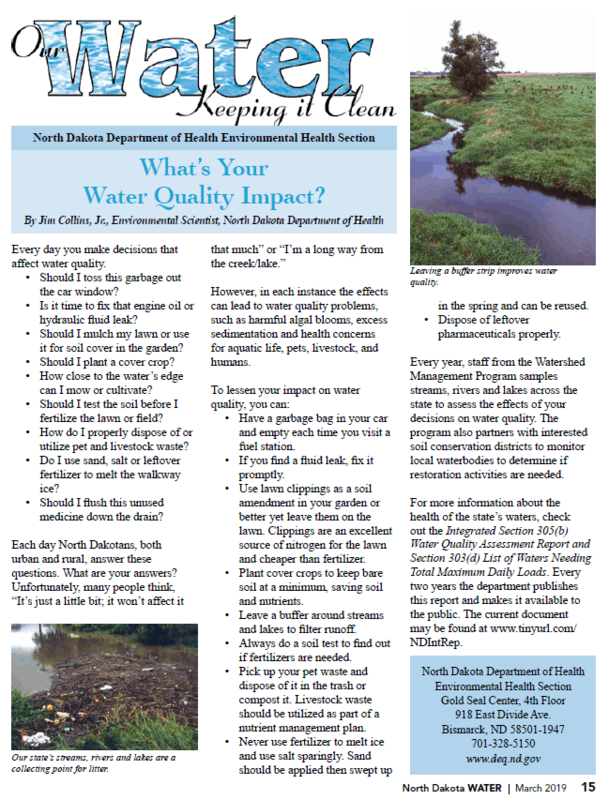 What’s Your Water Quality Impact? 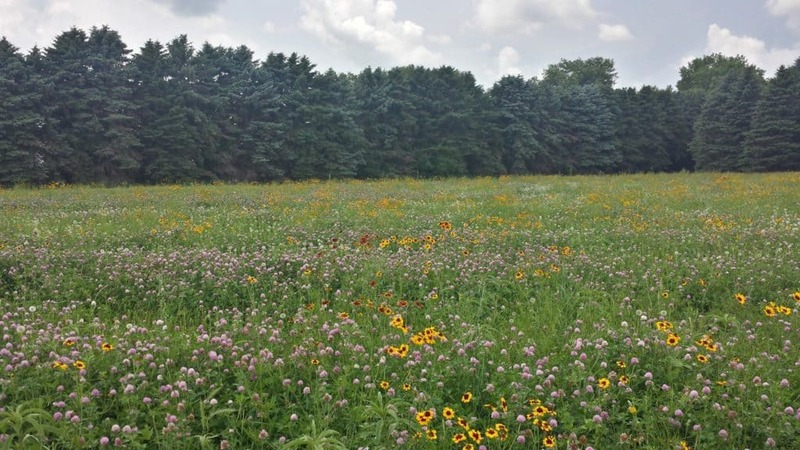 River Keepers is partnering with Clay County Soil and Water Conservation District and Cass County Soil Conservation District to host a two-day Pollinator Habitat Workshop! Discover the benefits of pollinator habitats and learn how to design your own prairie garden in two classes on March 19th and March 26th from 6 – 8 p.m. at the Probstfield Center for Education in Moorhead, MN. Pollinators and pollinator habitats offer many benefits: they provide food, improve biodiversity, help with soil stability, improve water quality, and much more. Pollinators like bees, birds, and insects are crucial for flowering plant reproduction and the production of many fruits and vegetables. Unfortunately, the status of pollinator populations is in decline – but you can help! The two-day workshop will cover the basics of what constitutes a pollinator habitat and explain the importance of landscaping with native plants. Participants will also learn the process of installing their own pollinator habitat from start to finish. They’ll leave with the start of a design plan and a pollinator-friendly kit – included in the ticket fee – just in time to prepare for spring landscaping. Course fee: $19 ($14 for Moorhead residents). Course fee includes pollinator kit. Secure one of the few spots left by registering through Moorhead Community Education. Does this brutal winter have you itching to get back outside this spring, but unsure of how to get the most out of your time outdoors? Look no further than the river that flows through our city’s backyard. Since the 1980s, anglers from all over the country have been venturing to the Red River, a premiere fishery for channel catfish. This exciting outdoors activity is a great way to get your friends and family out of the house and onto the river! Don’t know how to catfish, need a refresher, or want to level up your skills? Here’s your chance! River Keepers is teaming up with Brad Durick Outdoors to host Catfish University, a series of two workshops designed to teach you everything you need to get started. Introduction to Catfishing (March 13th): Whether you already enjoy catfishing or aren’t sure where to start, this class will teach you all of the basics you need to know. We’ll go through everything from gear, baits, and basic catfishing locations that will start you off on the right foot. This class will get you on track to catfishing success! Advanced Catfishing (March 20th): The next level beyond the basics of catfishing. If you’ve completed the intro course and want to learn more, or if you’re an experienced catfisher looking to up your skills, this is the course for you. Here, we’ll dive deep into river structure, current, and how catfish utilize these. We’ll also cover electronics and efficient catfish angling to make you more successful at catfishing. More success = more fun! Captain Brad Durick is a nationally recognized catfish guide on the Red River of the North, seminar speaker, and author. River Keepers is a non-profit passionately committed to advocating safe and sustainable use of the Red River through recreational activities, learning seminars, and much, much more. Course fee: Both classes $39. ($34 for Moorhead residents) or one class for $29 ($24 for Moorhead residents). Register through Moorhead Community Education. Can’t attend the workshops but want to learn more? Buy River Keepers “Relaxed Anglers Guide to Catfishing on the Red River of the North. * 10:30 a.m. on Saturday, January 26th at the Hjemkomst Center AKA The Frozen Fortress during Frostival. Meet at the Hjemkomst Landing Canoe & Kayak Rental Shack for an interpretive walk of the downtown Moorhead area. * 1:30 p.m. on Sunday, January 27th at Edgewood Golf Course. This will be a hike along the banks of the Red River within the city limits of north Fargo. Discover the wild, wooded corridor between the urban community and the river. Meet just off the parking lot of Divots at Edgewood. Dress warm and in layers! Please submit your nomination for an award winner by March 1, 2019. RIVER KEEPER OF THE YEAR recognizes outstanding service as a result of activities associated with the enhancement of the Red River. This individual or organization must have played a significant role in activities which have enhanced the River, increased enjoyment of the River or improved perceptions of the River. The individual or organization may also have advocated on behalf of the River or conducted any unique effort to befriend the Red River. EDUCATION AWARD recognizes outstanding leadership in education that has contributed to a better understanding of the water resource and the impact of the Red River on the area's history, environment, and recreation. ENVIRONMENTAL AWARD recognizes outstanding leadership in protection of the River environment relative to environmental concerns, water, soils, vegetation, and wildlife. GOOD NEIGHBOR AWARD recognizes individuals or organizations whose property touches the Red River. Their outstanding efforts may include upkeep of River property which maintains the integrity of the River, activities which have enhanced the River or the enjoyment of the River, or any unique effort to befriend the River. RIVER DEVELOPMENT AWARD recognizes outstanding leadership in the creation of economic opportunities in the River corridor. The economic activities should promote the Red River while maintaining compatibility with River Keepers developmental and environmental goals. Eligible activities could include River related businesses, tourism, or recreational events focusing on the River. VOLUNTEER OF THE YEAR AWARD recognizes outstanding volunteer work in promoting the goals of River Keepers. FRIEND OF THE RIVER AWARD recognizes outstanding leadership in the promotion of a River Keepers goal. PARTNERSHIP AWARD recognizes agencies that have partnered together to promote the Red River and the goals of River Keepers. In 100 words or less, summarize the reasons your nominee should receive the award as it relates to the Award Categories description above. Please provide detail regarding specific accomplishments of your nominee as they relate to the Award Categories description above.